Get to know your very own LG G2 with the help of Sydney CBD Repair Team. 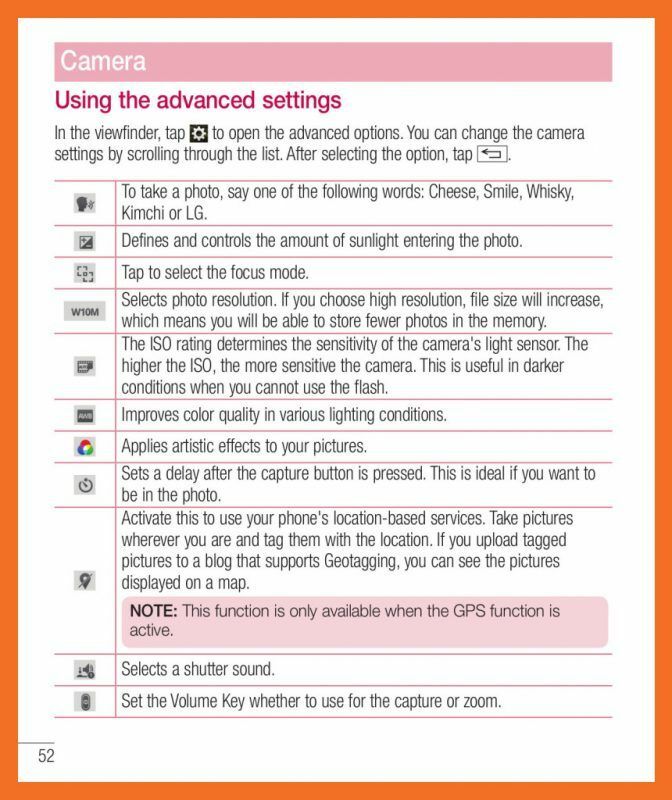 Read the manual to get the most out of your smartphone. 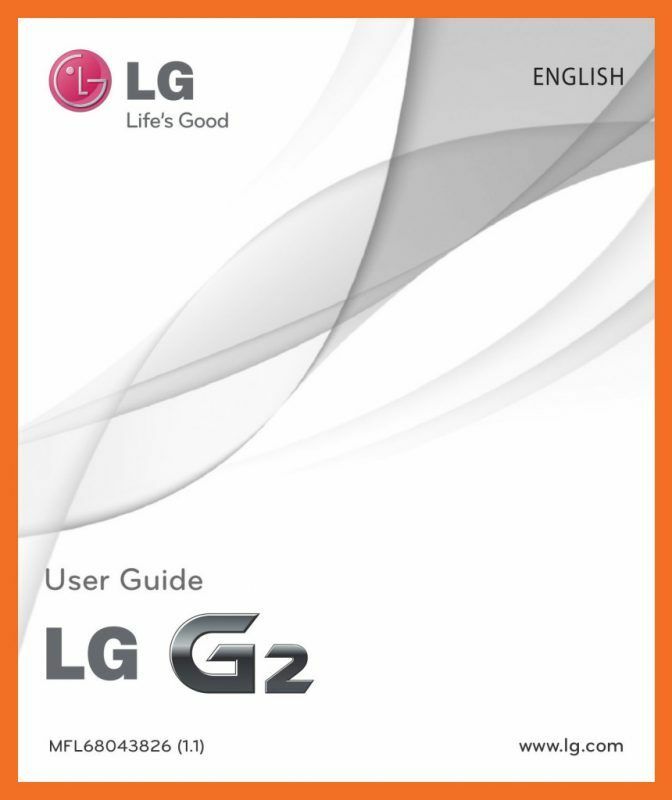 Know what powers the LG G2. 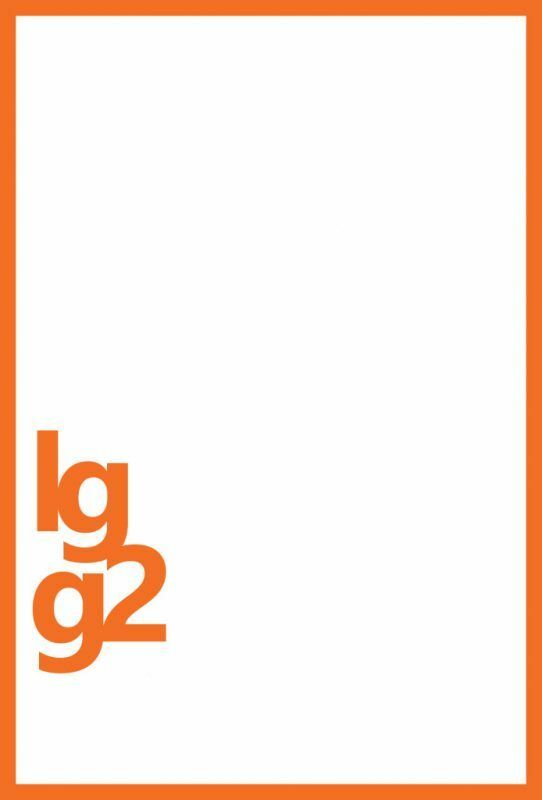 Got a LG G2 cracked screen? Don’t worry, have the lowest repair rates in Sydney with Sydney CBD Repair Centre! 1. Insert the micro-USIM ejection tool that comes with the phone (or a thin pin) into the eject button aperture, and push gently but firmly until the tray pops out. 2. Remove the tray and place the micro-USIM card inside it, with the contacts out and the angled corner to the right. There is only one possible way to fit the card snugly into the tray. 3. Carefully reposition the tray in the slot and push it gently back into the phone. NOTE: Make sure the gold contact area on the card is facing downwards. Charge the battery before using it for the first time. Use the charger to charge the battery. A computer can be also used to charge the device by connecting them via the USB cable. Use only LG-approved chargers, batteries and cables. If you use unapproved chargers, batteries or cables, it may cause battery charging delay or pop up the message regarding slow charging, Or this can cause the battery to explode or damage the device, which are not covered by the warranty. 1. Tap Home icon > Apps tab > Settings > Networks tab > Wi-Fi. 2. Set Wi-Fi to ON to turn it on and start scanning for available Wi-Fi networks. 3. Tap the Wi-Fi menu again to see a list of active and in-range Wi-Fi networks. 4. Tap a network to connect to it. 5. The status bar displays icons that indicate Wi-Fi status. 1. Tap Home icon > Apps tab > Settings > Networks tab > set Bluetooth to ON. 2. Tap the Bluetooth menu again. You will see the option to make your phone visible and option to search devices. Now tap Search for devices to view the devices in the Bluetooth Range. 3. Choose the device you want to pair with from the list. 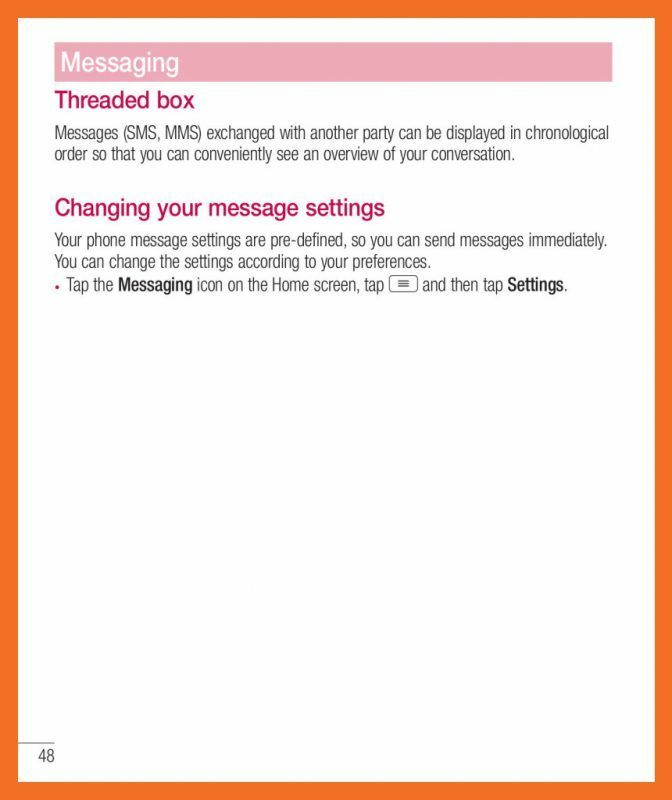 Once the paring is successful, your device will connect to the other device. NOTE: Some devices, especially headsets or hands-free car kits, may have a fixed Bluetooth PIN, such as 0000. If the other device has a PIN, you will be asked to enter it. 1. 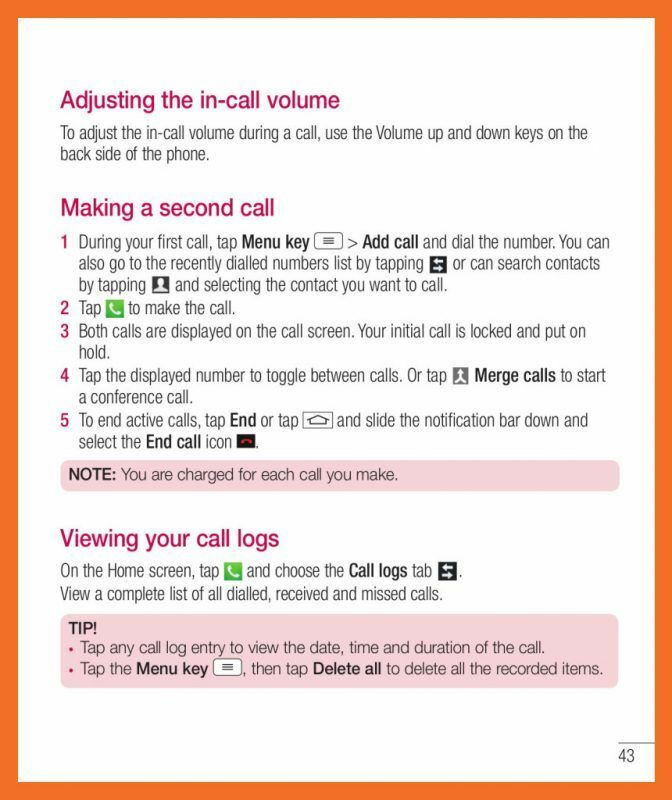 Tap Dialer to open the keypad. 3. Tap Dial to make a call. 4. 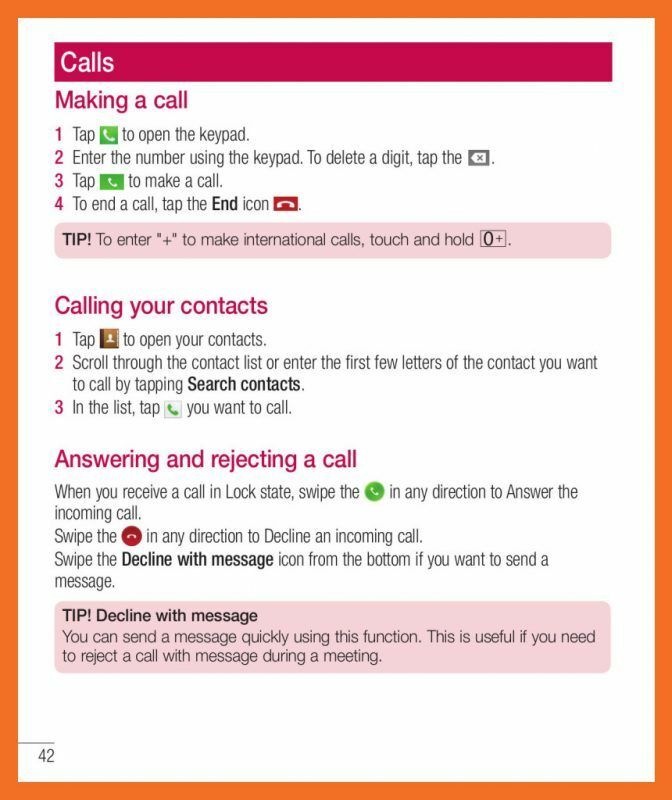 To end a call, tap the End icon. 1. 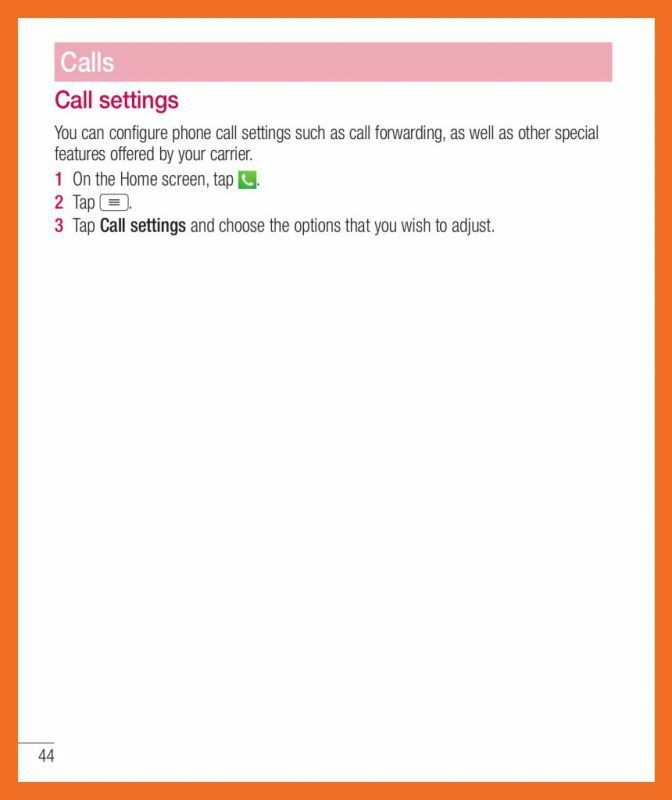 Tap Dialer, enter the new contact’s number, then tap the Menu key . Tap Add to Contacts > New contact. 3. 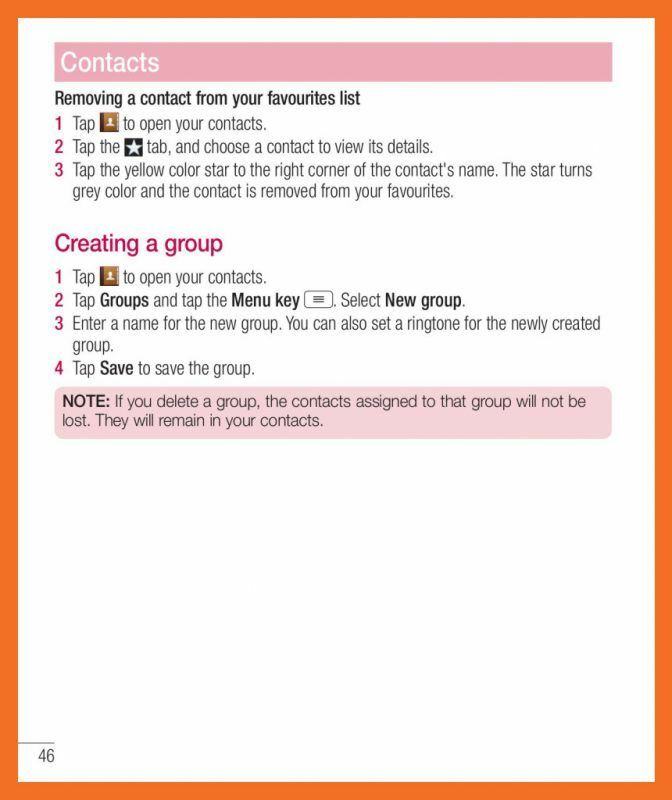 Select the contact type by tapping more icon. 4. 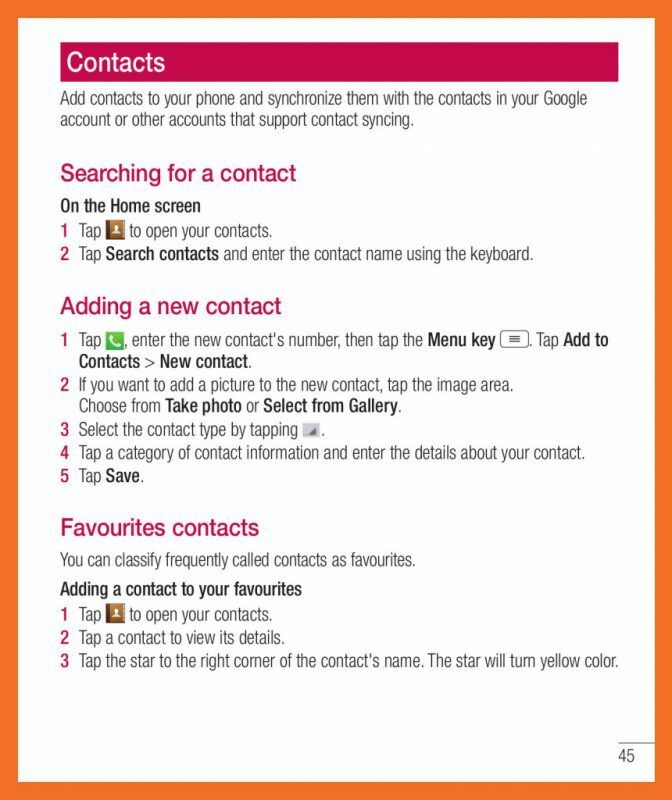 Tap a category of contact information and enter the details about your contact. 4. 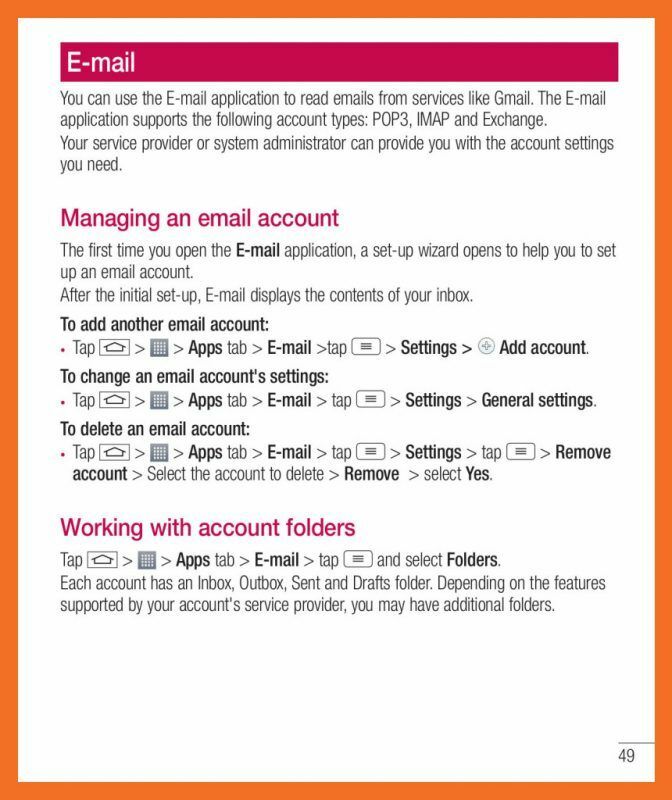 Tap Options to open the Options menu. 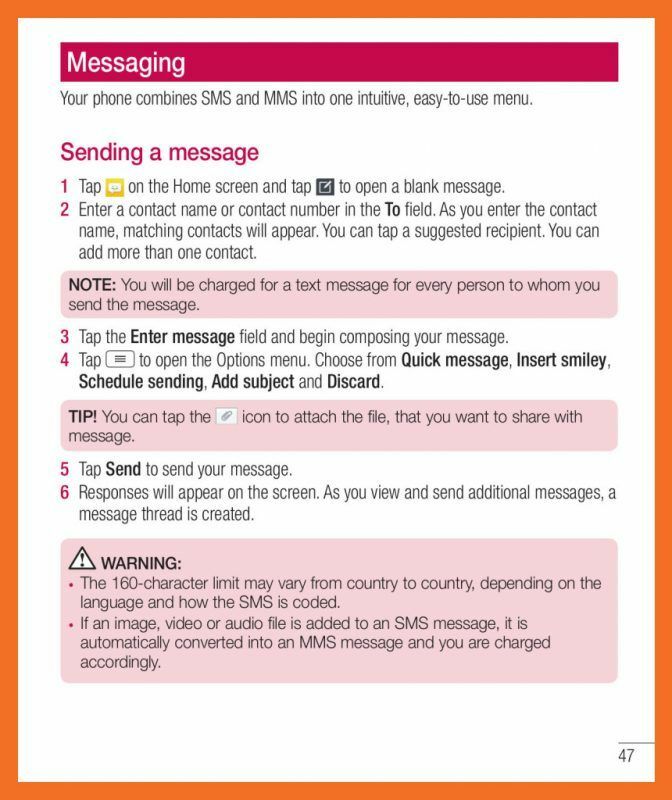 Choose from Quick message, Insert smiley, Schedule sending, Add subject and Discard. 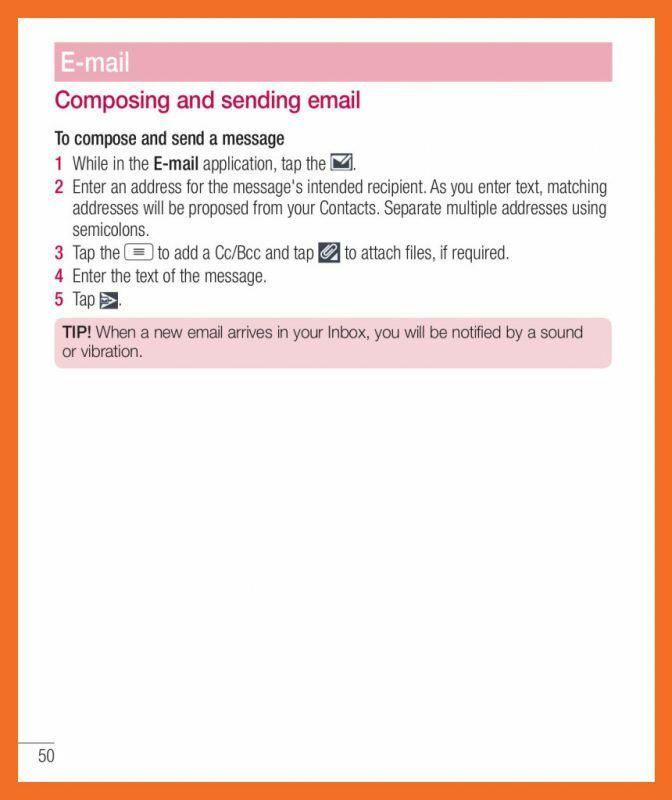 3 Tap the Options icon to add a Cc/Bcc and tap the paper clip icon to attach files, if required. 1. 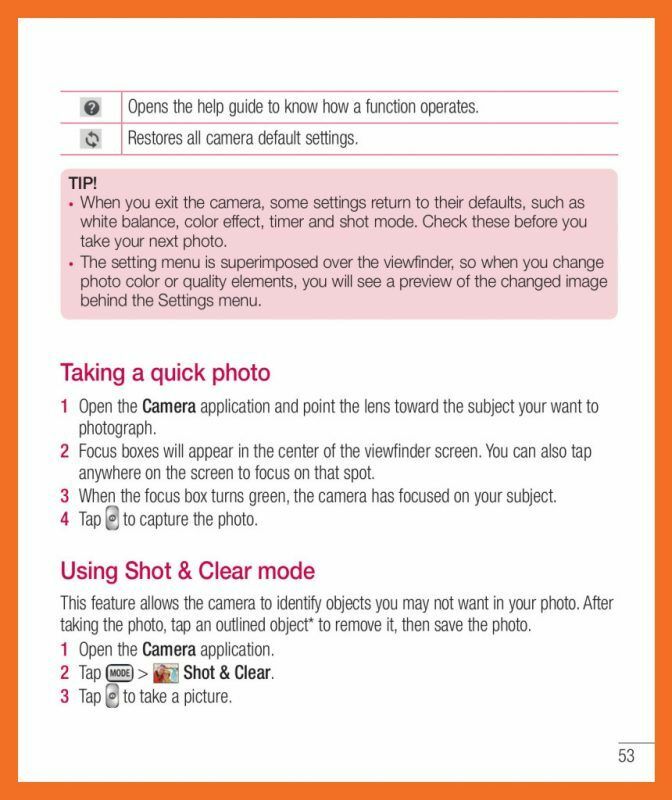 Open the Camera application and point the lens toward the subject your want to photograph. 2. 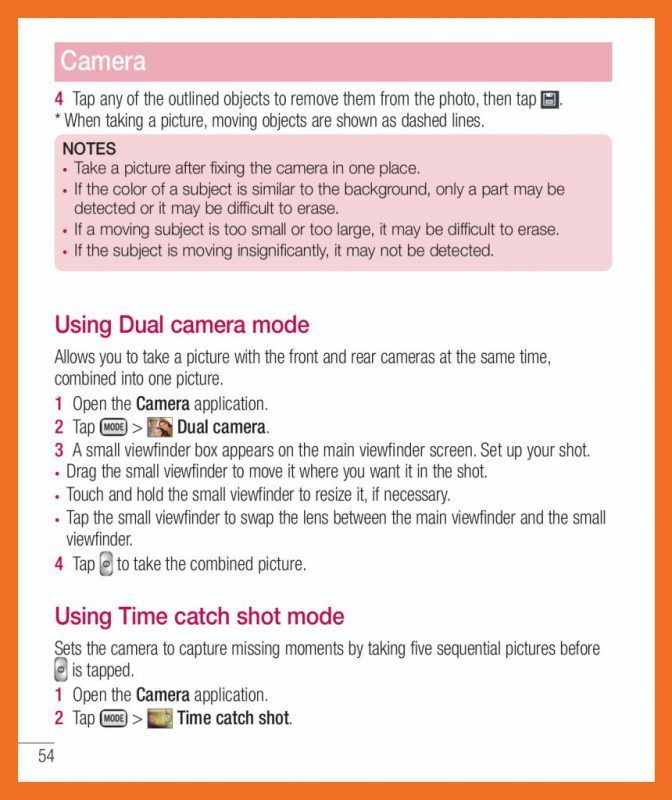 Focus boxes will appear in the center of the viewfinder screen. You can also tap anywhere on the screen to focus on that spot. 3. When the focus box turns green, the camera has focused on your subject. 4. 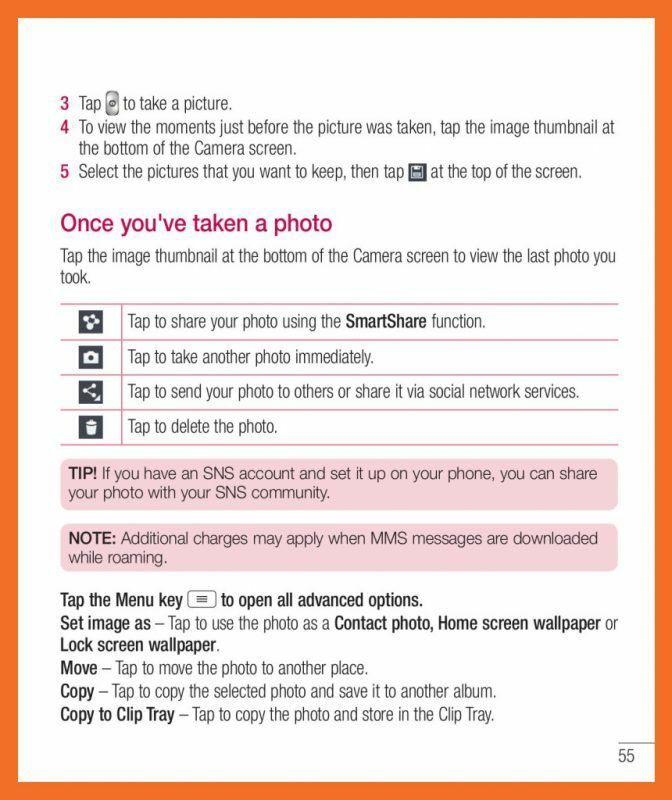 Tap shutter button to capture the photo. 1. 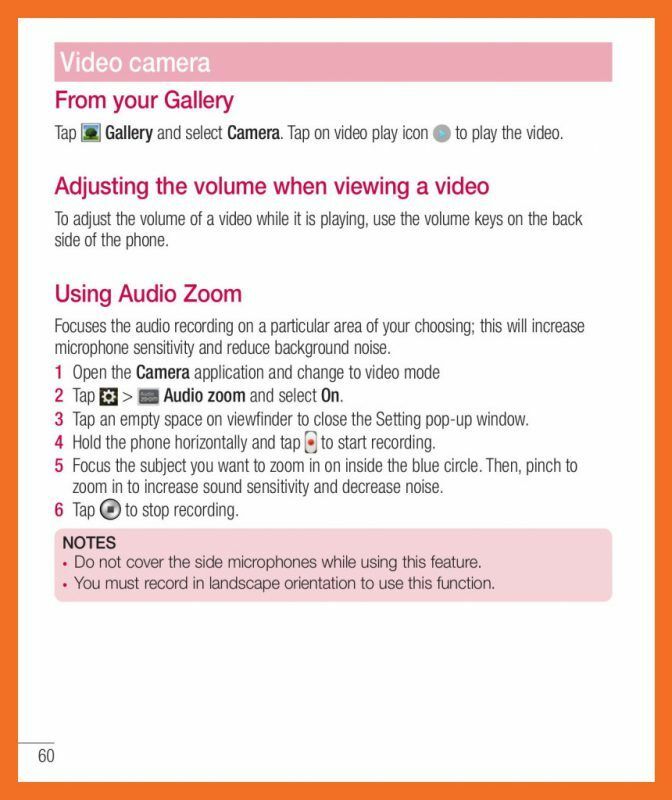 Open the Camera application and slide the Video mode button. 2. 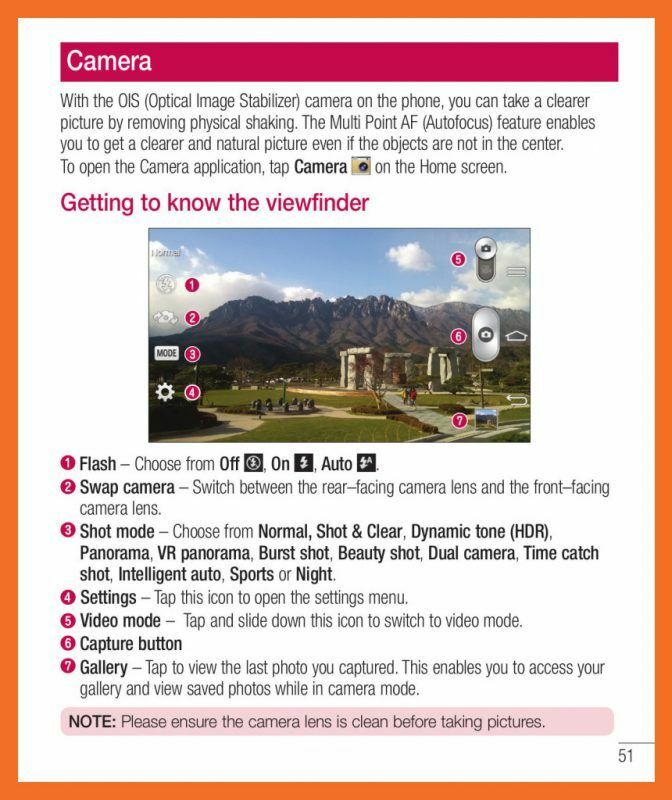 The video camera viewfinder appears on the screen. 3. 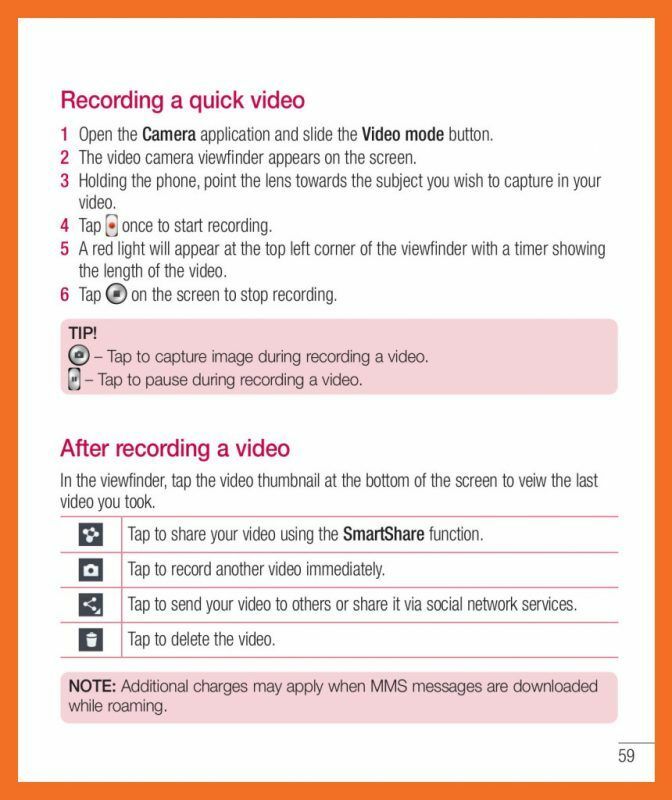 Holding the phone, point the lens towards the subject you wish to capture in your video. 4. Tap once to start recording. 5. 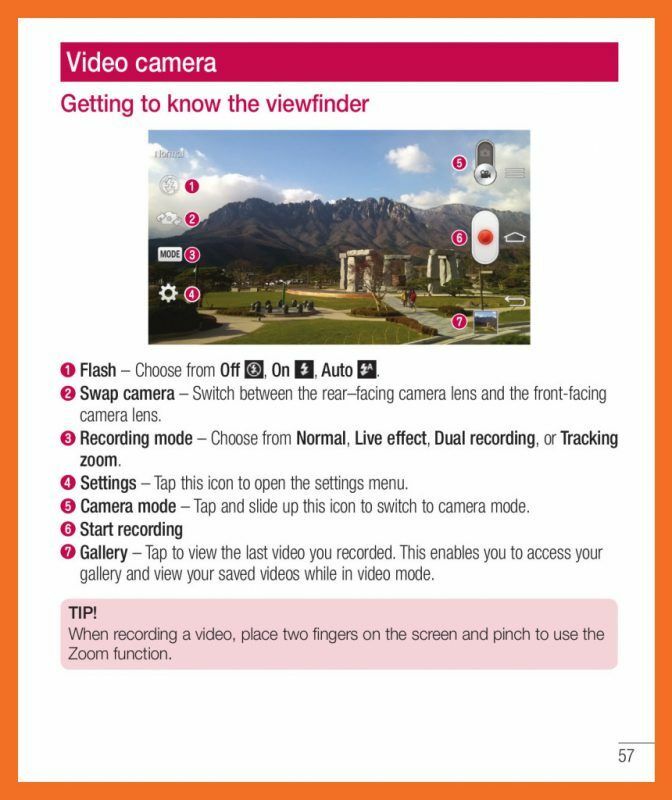 A red light will appear at the top left corner of the viewfinder with a timer showing the length of the video. 6. Tap stop recording on the screen to stop recording. 1. Tap Home icon > Apps tab > Calculator. 5. To check the history, tap the icon drop down arrow. 2. Tap record icon to begin recording. 3. 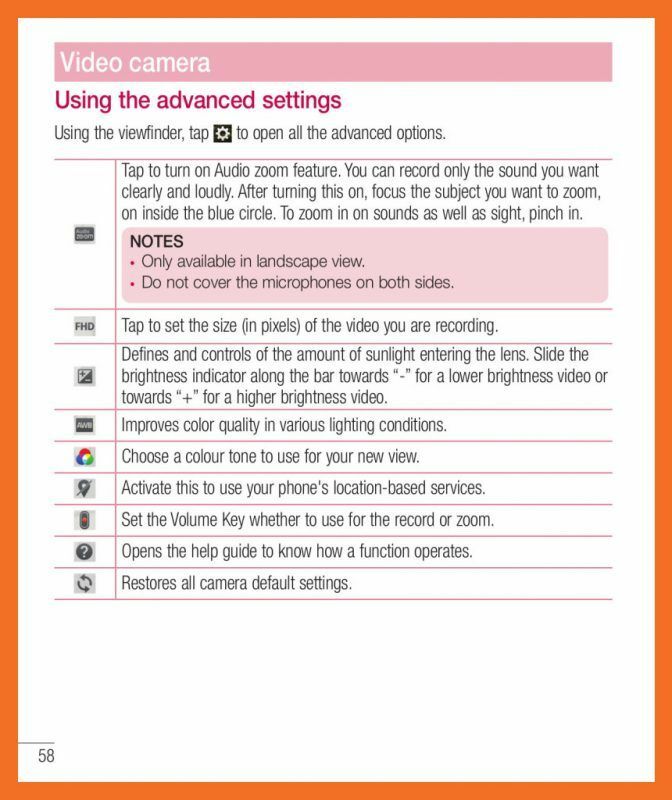 Tap stop icon to end the recording. 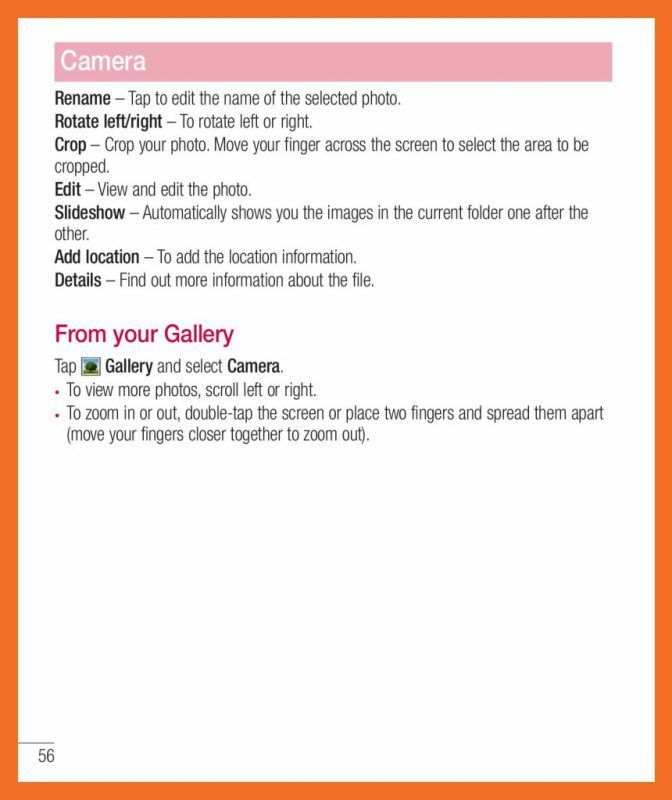 NOTE: Tap options to access your album. You can listen to the saved recording. 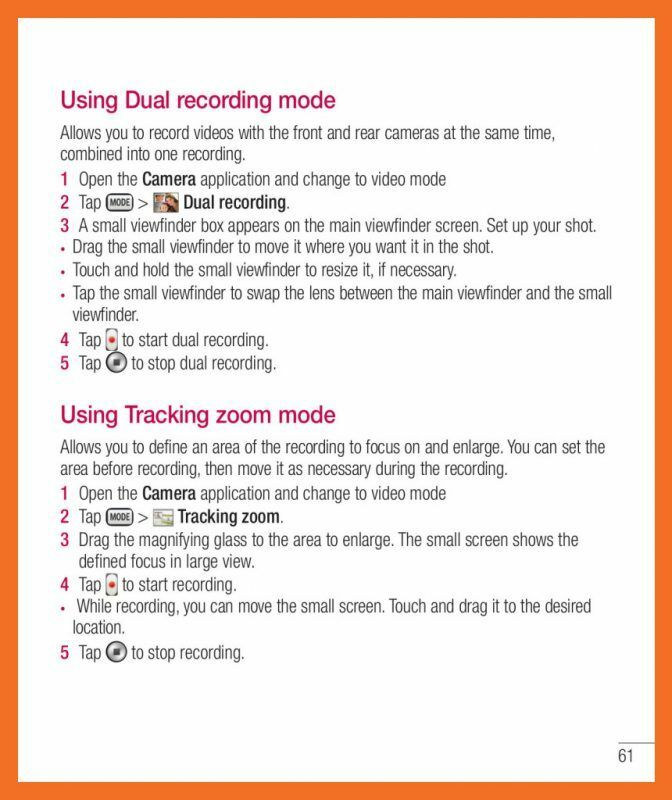 The available recording time may differ from actual recording time. 1. Tap Home icon > Apps tab > Alarm/Clock > Plus icon.